Detail from Decarpentry’s Academic Equitation. There is a lot more in the work in-hand than the hand. The work in-hand that we practice is inspired from General Decarpentry’s idea. But Decarpentry’s Academic Equitation was published in 1949 and considerable progress has been made since in understanding equine biomechanics and also in moving from human dominance to greater respect and understanding of the horse’s mental processing and capacities. Decarpentry’s in-hand approach was an evolution from the principles emphasized at this time. He advised touching the horse’s chest with the whip to initiate forward motion. The classic author thought was that touching the flanks might trigger lateral displacement of croup. It was step forward toward the thought that a movement is useful only if the horse’s physique is properly coordinated for the move; straightness is a prerequisite for forward movement. The advice was clever but remained at Pavlovian level. Instead, actual science demonstrates that for a great part amplitude of the gaits and excellence of the performances are the outcome of elastic energy stored and reused in tendons, aponeurosis, fascia and muscles. The dialogue with the horse is about creating the conditions, balance, cadence, frequency, optimizing storage and reuse of elastic energy. The first day working in hand, you will be out of control. One week later, you will remain out of control but you will start to get used to it. Then, the magic starts. You gradually awake to consciousness. You evolve from “The little me with my life” to the realization that the horse could have left the ring anytime he wanted. He chooses to remain by your side because he is not an enemy to be dominated but instead a partner willing to work with you. The reins are between the fingers of your right hand or left hand if you do it from the right side, and the horse, a 1200 or 1600 pound athlete walks, trots, and canters by your side following minute changes in the tone of your back and abdominal muscles. It is truly magical but it is the practical application of advanced science. You will never reach this magic if you hold the reins with two hands and activate the hind legs with a whip. You will never reach this magic if you remain at the level of obedience, stimulus response, correct aids equal correct movement. Using stimuli developed for gauging human tactile sensitivity, C. A. Saslow was very surprised to find that the horse’s sensitivity on the part of his body in contact with the rider’s legs is greater than human sensitivity even in an area of high tactile perception such as the tip of the fingers. The horse can react to variables in touch and the tightening of muscles that are too light for humans to feel. When Lafayette reacted to subtle nuances in my muscle tone, I did not believe that he could feel me, as it was not within the norms emphasized in classical education. It was not at the level of refined gestures, aids; It was at the level of subtle nuances in muscle tone. I was not riding him, I was walking by his side with only the reins between the fingers of my right hand. Lafayette did it several times and without understanding how it was possible, I explored variations in muscle tone and Lafayette responded. The first steps were therapeutic. Lafayette walked out of six months stall rest due to a fracture of his offside hind leg coffin bone. The steps had to be slow, cautious, with optimum hoof placement. As I was questioning in my mind how I could achieve such perfect hoof placement, I adjusted unconsciously the tone of my back and abdominal muscles and Lafayette responded, opening a capacity of perception that has always been there but that I never saw through my “equitation of gestures”. We walked one minute, 10 minutes, 30 minutes, and one hour every day, side by side, at an extremely slow and collected walk. It was totally done by him adjusting the coordination of his back to the coordination of my back. American Drum horse Bridget Jones aka “BJ”, working in-hand following Science in Motion’s in-hand course. Decarpentry initiated the work in hand for performances. 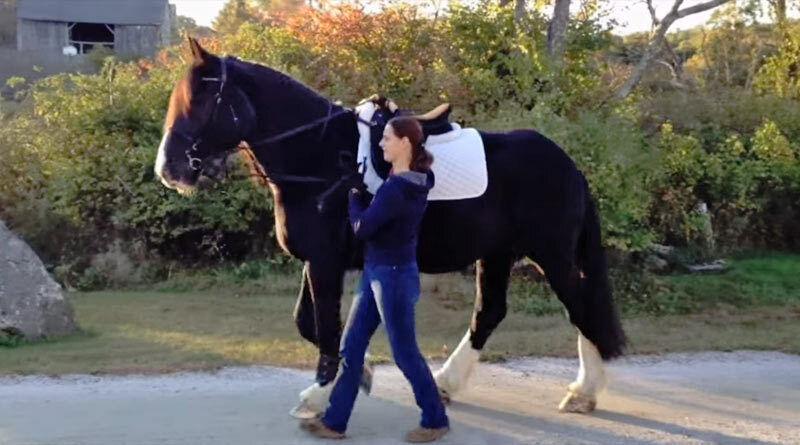 Applying the new knowledge of equine perception, we upgraded his in-hand approach to an education of the horse’s back through the coordination and tone of the trainers back. From the hands/whip approach which can only teach tricks, we raised the work in hand to a harmonic tensegrity approach, being conscious of the extraordinary perception and willingness that the horse is capable off. Exploring and discovering the astonishing feeling and pleasure of a horse following subtle nuances in the tone of your abdominal and back muscles, you realize that you have the skill and your horse has the talent to reach an equitation that the ones who cannot move out of “the little me with my life,” will tell you that it does not exist. Jean Luc Cornille’s Science in Motion offers an In Hand Therapy Course. Decarpentry was more knowledgeable than you gave him credit for. In spades! It’s common to be carried away by terminology that is organized along scientific principles. And a little arrogant. The practical experience of people like Decarpentry if read through eyes withsimilar experience will make complete sense. The science tend to catch up later.